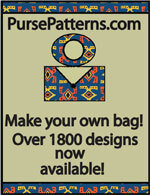 The Rural Correspondent Bag Pattern by Charlie's Aunt is a vintage inspired messenger bag design based on styles of the 1940's. 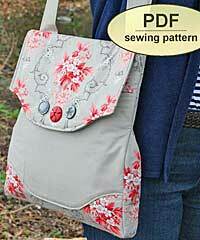 There is a contrasting front pocket and a decorative front flap trimmed with vintage buttons. 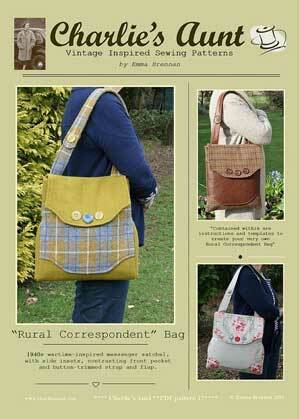 The Rural Correspondent Bag Pattern is a retro 1940's inspired messenger style bag that has a contrasting front pocket, a two part strap, and a flap. Finished size is approximately 15”H (38cm) x 15”W (38cm) x 2”D (5cm). 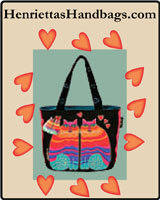 The Rural Correspondent Bag PDF pattern has 16 pages – 9 pages including photographs, detailed step-by-step instructions and illustrations, plus 7 pages of full sized pattern templates which you must print on 8 1/2" x 11" letter size paper and cut out. All templates are actual size but two of the pieces are too big to fit on one sheet so you will have to tape them together after you have cut them out.